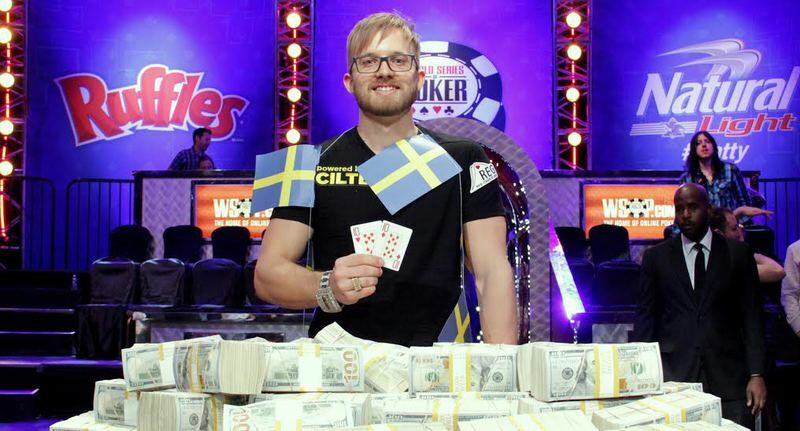 The 2014 World Series of Poker main event champion is 27-year-old Swedish poker pro Martin Jacobson, who earned his first career bracelet and the $10 million first-place prize. When asked how the money would affect his life, Jacobson stated that the title was more important. In hindsight, Jacobson’s victory shouldn’t seem that surprising. After all, he was by far the most experienced live tournament player at the final table, heading into the contest with $4.8 million in career tournament earnings. What was surprising about the feat was the fact that Jacobson entered the final table in second to last place, hampered by a short stack. Throughout the final table, Dutch pro Jorryt Van Hoof got all of the praise for his ability to utilize the big stack, but Jacobson was perhaps even more impressive for maximizing his opportunities with limited ammunition. During the final day of play, Jacobson quickly gained the chip lead from Van Hoof, who went out in third place. With more than a 2-1 chip lead to start heads-up play, Jacobson slowly grinded Felix Stephensen down to just 15 big blinds. On the final hand, Stephensen opened for 3.5 million and Jacobson moved all in from the big blind. Stephensen made the call for his last 28.3 million with A 9 , but saw that he was in bad shape against Jacobson’s 10 10 . The flop came down 10 9 3 , leaving Stephensen drawing to running nines or aces in order to stay alive. The turn and river were the K 4 and Jacobson erupted in celebration with his rail. Stephensen, though dejected, was picked up by his Norwegian friends and family to congratulate him on his $5.1 million consolation prize. With his victory, Jacobson bested the previous best finish by a Swedish poker player at the WSOP main event in 2006 when Erik Friberg finished in eighth place. Jacobson also picked up 3,300 Card Player Player of the Year points, moving him into fifth place overall. Here is a look at the final table results. Click on each player’s link for more information about their individual main event final table performance. If you couldn’t get down to the Rio this summer, you can still compete with Carbon Poker. Click the banner below for more information. Card Player readers are eligible for an initial deposit bonus of 200 percent up to $5,000. Its awesome to see our laws and hard earned money at work to help others.